I’ve talked to you about my first drafts and how they require a great deal of editing. I think most novels require some level of editing after they’re complete. As much as we’d all like to produce J.K. Rowling or Stephen King level work on our first draft, I have yet to see someone who does. I try so hard not to cringe when I hear a writer say they’ve just finished up, they’re going to take a look at it, and then self-publish. 1. Beta reader Comments – this isn’t entirely fair as I don’t even let a story out to Beta readers until I’ve done a revision or two. But once I do send it out, I take their comments very seriously. These are no people who’ve spent months with these characters in their heads. They frequently see things more clearly than I do as I sometimes get lost in the trees and can’t see the forest. Do I like the hero or heroine? If either are unlikeable, time to rewrite. And no, this doesn’t mean they need to be “perfect”. Truly likeable characters seldom are.Is what the character doing within their personality? Are they making choices true to them? For example, is the British spy-master forgetting who he is and what he does to marry a woman being manipulated by a French spy-master. Please, please, please tell me no. Or go back and rewrite it. Do their words in the dialogue sound like them? I still struggle with this, but a prince and scullery maid should not be using the same words. Do I want to see them get what they want? Will the characters getting what they want give the reader that happy smile that says “I just read a great romance novel”. Invariably, I answer “no” to some of these things, and that means rewriting. Sometimes it means changing the characters early on in the story, and that usually flows into changes later. And that means the ending must change. *sigh* Perhaps with practice, I’ll get better at getting the characters right earlier in the writing process and not have to scrap the last 10-15% of the story. 3. Point of View – This is an area that an editor corrected me on. Once, romance authors were allowed to go back-and-forth between the hero and heroine’s point of view in the same scene. Best-selling authors and authors who started when this was allowed are still allowed to do this. Those of us that are trying to break into the genre aren’t. Changing the point-of-view and making sure I stick to it has been one of the most difficult aspects of rewriting for me. 4. Plot – A lot of this is taken care of by character actions. But, I want to make sure things are logical and consistent. Is anything happening that appears weird, unusual or out of context? Am I keeping things happening at a realistic but not boring clip? This should be true for the external plot as well as the romance itself. The romance is the main plot. But I can’t tolerate lack-of-communication or stupidity, so it has to be real things keeping the characters apart. Is it engaging? Do I want to know what happens next? 5. Descriptions – My first draft is pretty bare bones. What will ultimately be a 75,000 – 85,000 word novel starts out at around 50,000-60,00 when I’m done. Why? Because I’m so busy getting things done in the story that I skip right over descriptions. My first draft sort of takes place in a void. Yeah, there are occasional descriptors, but nothing that pulls in the reader with sounds and smells. Maybe even tastes. 7. Grammar, Punctuation and Spelling I don’t bother much with this in the first edit as so much that’s going to be rewritten, I wait and save this revision for prose I’m pretty sure isn’t going to just get cut. How about you? 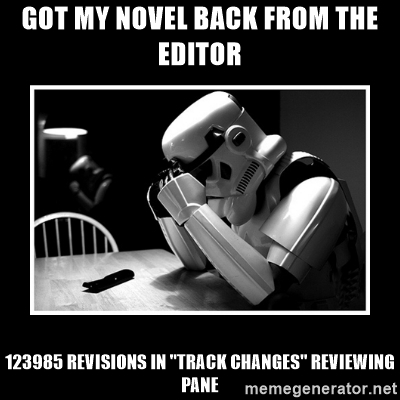 What’s your rewriting/editing strategy? How do you tackle it? What do you look for first? How long do you wait after writing the first draft to start revising it? This is really good. Saved to Instapaper for when I finish my draft this month. Thank you. It is so nice to see someone else has a first draft grow and bloom in the revision process. I don’t just forget smells and taste. I have stick figures in white rooms. Sometimes gender less stick figures. I just tried to work on a scene and I realized the side character was so not described I only know he was a dude because -I- know he was supposed to be a dude. Tall/short/thin/heavy/loud/quiet/gender/race? Whatever. Yikes. So I’m trying to have that not just all be a vague part of my brain. Needs to be on paper. Sometimes we just have to get the story down! And yes, I am guilty of white rooms in my first draft, too.